Castlemilk Morrit Sheep were developed during the the early years of the 20th century. The late Sir Jock Buchanan-Jardine began a breeding program on his Castlemilk Estate in Dumfriesshire. 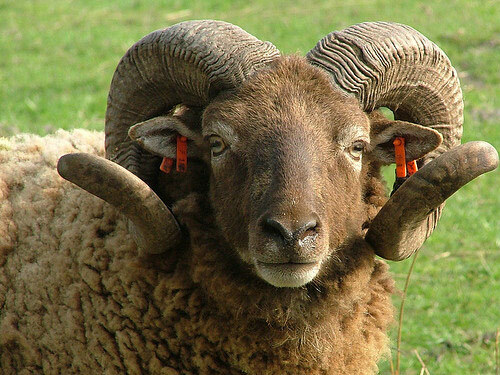 Using Manx Loghtan, moorit Shetland, and wild Mouflon, he developed a breed to beautify his parkland and provide fine, kemp-free moorit colored wool. On the death of Sir John Buchanan-Jardine the flock was dispersed in 1970, and six ewes and a ram were bought by Joe Henson at the Cotswold Farm Park. All of todays Castlemilk Moorits are descended from these few sheep. The Castlemilk Moorit is one of the larger primitive-type breeds, with mature ewes weighing in the region of 40 kgs. (85 lbs.) and rams 55 kgs. (120 lbs.) The ewes exhibit two uniform and wide spreading horns which are much heavier and evenly spiralled in the rams. Light brown or moorit in color, they have definite mouflon pattern markings to include white underparts around the eyes, lower jaw, belly, knees and inside lower leg and tail together with a rump patch.